Last week, my Mum came to visit for a few days. She spoils me like crazy so, naturally, she treated me to a pedicure. Now, it wasn't just any old pedicure. Nope. My Mum took us to the place with the CRAZY CHAIRS! Crazy chairs, you ask? Oh yes. When you sit in the chair, it leans all the way back! At first, it's like, WHOA, but then it gets really comfy. They also offer you a blanket. Apparently some people fall asleep. Not a huge surprise there. 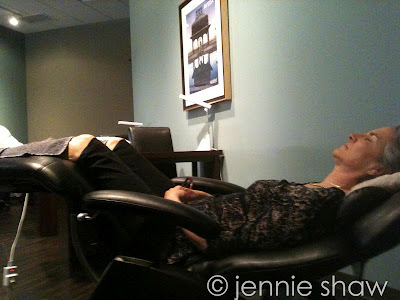 The aesthetician said that they love the chairs because they don't have to crouch. I see her point, there. Who the heck would want to sit on the floor all day staring at people's feet? Haha! And this is the colour I chose. From OPI's new Holland Collection. It's called I Don't Give a Rotterdam! and I took this picture a week and a half after getting them done. The holdup was remarkable! Thanks for the linkup, Tara and Vicki! love what you did with the grey :) cute! Those chairs are amazing! Love the "pizazz". Thanks for visiting my blog! I am loving the grey! I might have to hunt that one down on eBay!